Disclosure: This site receives a payment from Amazon when you purchase a product using any links to that company in this article. One of the regulators of our circadian rhythms is melatonin, which is a hormone that helps us sleep. Our body naturally produces melatonin at night as it gets near bed time. How does our body know when it’s night? Well, it’s supposed to get dark at night, but with the advent of indoor lighting, computers, and cell phones, it doesn’t really get that dark at night. We constantly have light being pumped into our eyes at night, so our body doesn’t know it should be producing melatonin. A Harvard University study has shown that blue light is the strongest suppressor of melatonin. To get a better night’s sleep, all you need to do is stop having blue light pumped into your eyes at night. I think it would be an impossible task to convince you all to stop watching TV, using your smart phones and playing computer games at night, but there is an inexpensive alternative. Put them on about 2-3 hours before you want to go to sleep and let your body naturally produce melatonin. You’ll be able to fall asleep more quickly and at the time you need to. Don’t believe me? Read the Amazon reviews and see what hundreds of other people have said. Or just buy them and try them for yourself. They’re only about 8-10 dollars. There are two versions made by UVEX that I recommend. The first is the one pictured above, the UVEX S1933X, which is good for people who don’t wear glasses. 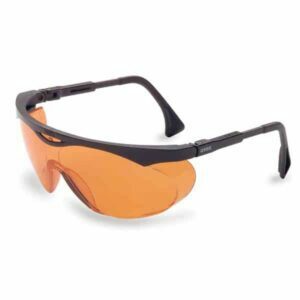 The other, the UVEX S0360X is designed to fit over your regular eyeglasses. Both get terrific reviews. If you have trouble falling asleep at night, try them out. The cost is virtually nothing compared to the health benefits of getting a better night’s sleep every night and waking up feeling more refreshed every morning. If this works for you, please let me know in the comments below, and share this with your friends and family so they can sleep better too. Thanks for reading. Wow, this is fascinating! As a night-owl/computer addict, maybe this will help me get to sleep easily. Excellent, let me know how it works for you. I can honestly say I've never heard this before. Will try it!